Already flush with Hannah Montana and the High School Musical movies, Disney Channel will add the Jonas brothers to its kid-powered arsenal with a new comedy series set to premiere on Saturday, May 2nd. 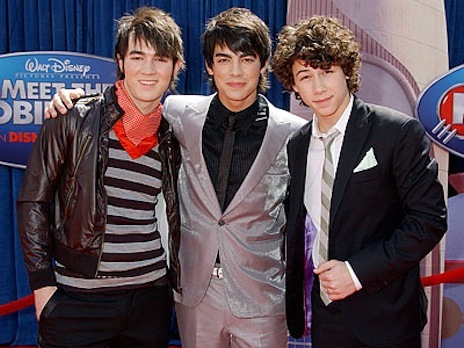 It's not surprisingly titled JONAS, even though Kevin, Joe and Nick will be playing brothers with the surname Lucas. But they'll still be "rock and roll superstars" navigating their way through "unexpected, unpredictable and often absurd situations . . . as they try to live ordinary lives," says a Disney publicity release. Original songs also will be created for the show. The first episode, titled "Wrong Song," will be available a week before its cable air date via the On Demand services on Time Warner and Verizon Fios among others. The brothers recently bought a house in the Dallas suburb of Westlake, but have had little time to occupy it during an ongoing promotional blitz. Disney says their TV show will emphasize music and comedy, which the network describes as "the two primary drivers of the kid and tween entertainment landscape."